i love both your jacket and jeans! Uggggh that JACKET! I wish I'd snagged it! So good. You look fab, my dear. i love your jeans! the studs are such a nice, simple touch! Love the BB Dakota jacket, and those FAB heels. Great going-out outfit! What a great jacket to get as an exchange. It looks so lovely on you. It reminds me of Michael, who I miss so dearly! i need a jacket like that!i need to do my own tribute to Michael!! I love your jeans! Its making me want to add studs to a pair of my own. You look great. Well done with the jeans! 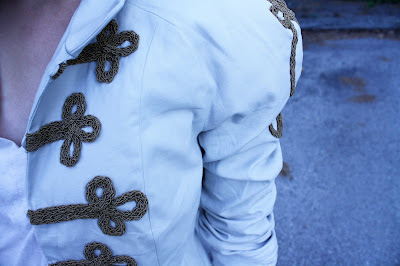 I love that military-inspired jacket! 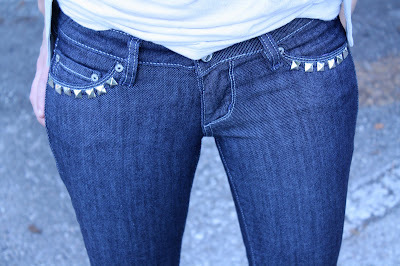 I think your studding on your jeans is simple and makes it more versatile!